The 3rd-seeded ’07-’08 Detroit Red Wings carried play for most of this series, but it was the 30th-seeded ’85-’86 Hartford Whalers who pulled off the upset in six games. The Red Wings averaged 48.3 shots on goal per game while the Whalers averaged only 34.5 shots on goal per game and Hartford was able to outscore Detroit by only a total of four goals in the series. The Wings had a pretty balanced scoring attack with 16 different players registering a point and Pavel Datsyuk led them all with 11 points over the six games. Henrik Zetterberg was second, of course, behind Pavel with 8 points. However, it was The Mule, Johan Franzen, who led them in goal scoring with five genos. Datsyuk and Zetterberg were tied with Valtteri Filppular for second with four goals. Pavel also led Detroit in helpers with seven assists while defenseman Nicklas Lidstrom was second with five. Chris Osgood was the starting goaltender for Detroit at the beginning of this series, but was pulled after Game 3 for his rocky performances. He finished the series with four total appearances and a record of 1-2-0 with a 3.50 goals against average and a .857 save percentage. His replacement after Game 3 was Dominik Hasek, who didn’t fair much better. He also posted a 1-2-0 record to go with his 4.67 goals against average and a .864 save percentage. So, they really were not doing the Wings any favors with their play in net. The top line for Hartford was firing in all cylinders in this series. The trio of Kevin Dineen, Ron Francis and Sylvain Turgeon combined for a total of 30 points over the six games. Turgeon was tied as the overall scoring leader with 12 points with Ray Ferraro. Dineen was alone in second with 11 points. Turgeon was also the team’s goal scoring leader in the series with seven goals in the six games. Ferraro was alone in second with five while Dineen was right behind him with four. Ferraro was also the tied for the team lead in assists at seven with Dineen. Behind them, Francis and Turgeon were tied for second with five assists each. In goal, Mike Liut didn’t have to do much to out-duel his counterparts from Detroit. He posted a 4-2-2 record with a 4.00 goals against average, but a .917 save percentage, which was crucial since his team was badly outshot at times. 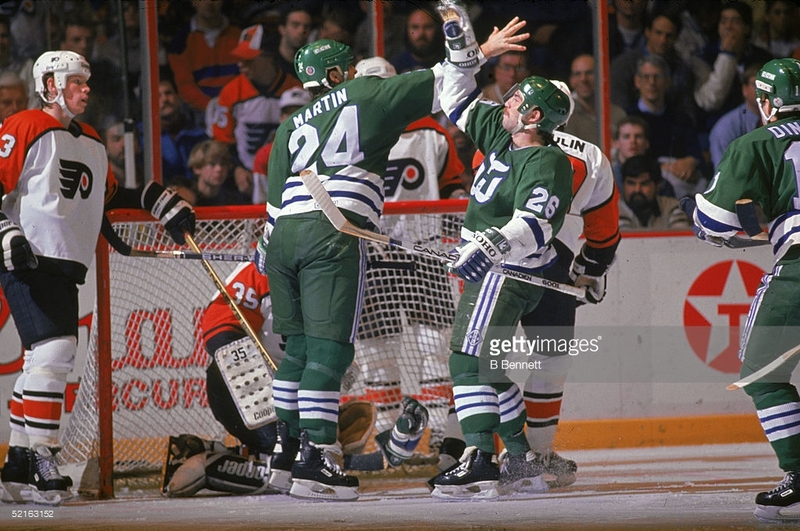 The ’85-’86 Whalers have appeared in all three Ultimate NHL Playoffs and they’ve incrementally done better ever year. After being a one-and-done in the inaugural tourney, they made it to the Second Round last year and now they have pulled off a major upset to clinch their first appearance in the Third Round. The ’07-’08 Red Wings have also appeared in all three UNP, but this is the first time they are one-and-done. They made it all the way to the Quarterfinal last year, but are out in the Second Round this year. Up next in the Second Round, the 5th-seeded ’12-’13 Chicago Blackhawks face the 28th-seeded ’72-’73 Minnesota North Stars! This entry was posted in 2nd Round, Ultimate NHL Playoff and tagged Chris Osgood, Dean Evason, Detroit Red Wings, Dominik Hasek, Hartford Whalers, Henrik Zetterberg, Johan Franzen, Kevin Dineen, Mike Liut, Nicklas Lidstrom, Pavel Datsyuk, Ray Ferraro, Ron Francis, Second Round, Sylvain Turgeon, Ultimate NHL Playoff, Valtteri Filppula. Bookmark the permalink.